Smartphones happens to be one of our daily necessities and due to this reason, it tends to fo through a lot of abuse daily. The LG V20 is the latest addition to the LG's V series and also the overall newest smartphone from LG. The LG V20 is a high-end flagship device from LG. The LG V20 has with its quad core processor 4gb RAM has proven to be a great device in terms of overall performance. But one other thing that a lot of people might be concerned about is the durability of the device and how well it will do under rough handling. 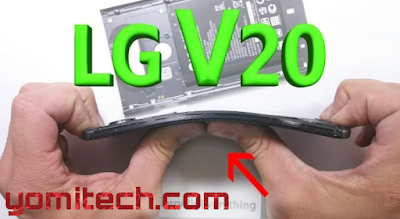 A youtuber JerryRigEverything has decided to put the V20 through a rigourous scratch, bend and burn test. Although the LG V20 comes with a screen protector out of the box, the screen protector had to be removed for the test. The screen's glass cover proved to be durable as it was resistant to coin and key scratch. Although the V20's back panel was made of metal, it was resistant to light scratches but tend to be scratched by objects like keys. The speaker grill and buttons were also made of metal and so tend to be sturdy. Even though most part of the device is made of metal, the top and bottom of the front panel were made of plastic which means they tend to scratch very easily. The fingerprint scanner and camera were also put to test. The fingerprint scanner passed as the fingerprint sensor still functioned very well even after the scratch test. The camera on the other hand tend to scratch and even shatter easily if there are small abrasions. The protective cover on the camera lens doesn't really do much in protecting it against impact. The LG V20 was also put through a burn test and although the screen started turning black after about 6 seconds, it actually recovered very quickly. The last test happens to be the bend test and although the V20 happens to be more flexible than the V10, the device handles the bend test very well and tends not to break easily. The battery and back panel poped out a little bit during the test, but that didn't affect the phone's functionality. So guys judging from this durability test and others that have been conducted on this device, I will conclude that this device is a good buy for anyone who needs a durable smartphone that will handle daily rigourous handling pretty well.